Finding a Boutique Hotel in Rajasthan to spend the vacation with your beloved one or family in one of the best luxury hotels in Rajasthan? Mesmerized with the views of nature and reliving in the midst of the sand and the paradisiacal Hotel in Pali, Rajasthan. Rawla Narlai is blessed with the enchanting beauty of its architecture, tucked in the midst of Aravali range, mesmerized with the countryside. It is an old architecture restored painstakingly as the most renowned Rajasthan Palace Hotel and also Heritage Resort in Rajasthan, themed with the culture and tradition of Rajasthan. Rawla is the Best Luxury Hotel in Rajasthan, situated ideally between the two major cities of Rajasthan, Jodhpur, and Udaipur. Rajasthan has always been the cities of heritage forts and palaces, and Rawla is the best luxury Hotel in Rajasthan facilitated with various luxuries. It is structured with themed boutique rooms for the stay and relishes the culture such as Grand Heritage, Luxury Grand Heritage, Jharoka Rooms, Narlai Suites facilitated with garden hill view, Wi-Fi, study table, closet, electronic safety and many other luxuries that add comfort to your stay. More of it, the dining is quite lavish themed with rural grandeur making sure the guest with culinary experience. The dining is situated ideally for mesmerizing countryside grace whilst having your appetite. With your mood and taste we offer Jharoka Café, designed bright and cheerful with a multi-cuisine menu, J Bar catering aesthetic cocktails and drinks with a rust-chic ambience and the best Dinner on the Ramparts which will appetize your soul with the ambience of the open dining in the night with desert sky accompanied by live traditional music adding taste to your appetite. With the Rawla Pool and the Narlai Spa, relax your mood with these amenities and feel the bliss of the beauty of Rajasthan Palace. A stay at this paradisiacal Rajasthan Place Hotel is intended to serve you the best stay, seizing the moment of the unmatched tradition of Rajasthan. 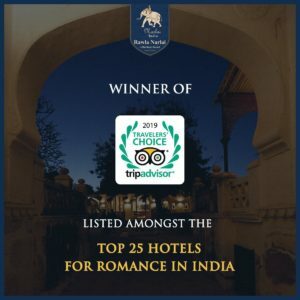 When you want to taste and live in the grace of heritage searching for solitude and a stay in Rajasthan palace, Rawla Narlai is the Best Resort near Jodhpur and listed in Udaipur Hotels as Rajasthan palace.